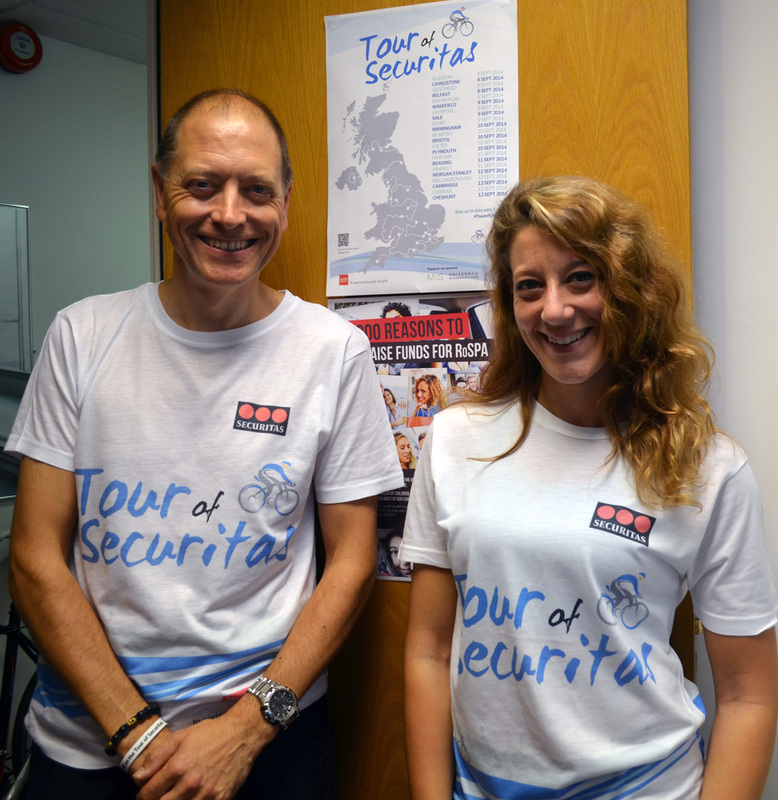 Last week the UK arm of security giant Securitas took part in a virtual static cycling tour. 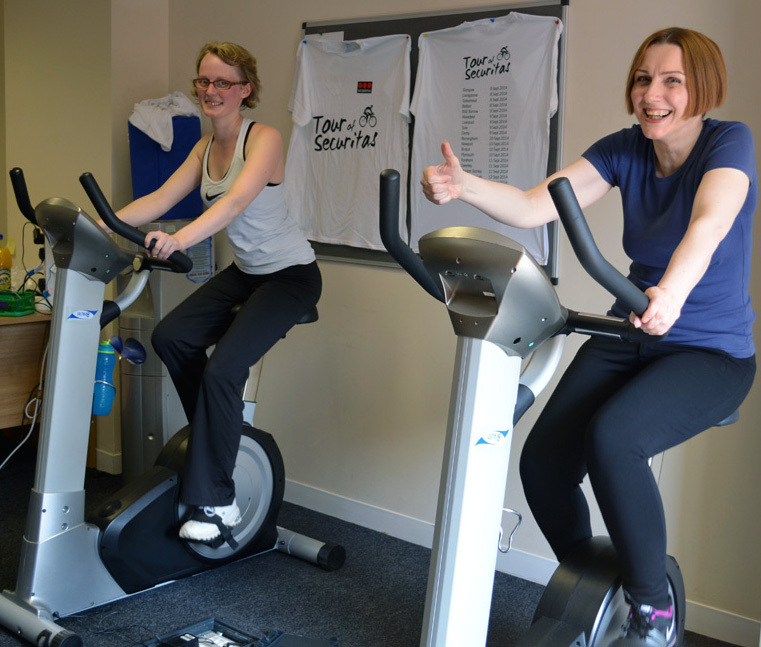 Twenty two offices took part in the Tour of Securitas, raising funds for RoSPA and awareness of safer cycling. Emma Isaac and Helen Halls in action. Our campaigns officer Helen Halls went along to two stages of the Tour. Here she shares her memories of an inspiring week. With colleagues from Scotland and Northern Ireland reporting back positively from Day One, I knew I would be in for an interesting time when I went along to Securitas’ Birmingham office on Day Three. I also knew I couldn’t let the side down – Colin, Jennifer and Sandy had all hopped on a static bike and added some miles to Belfast and Edinburgh’s total. I was struck straight away by the amazing atmosphere down at Cuckoo Wharf – and the effort Securitas staff were putting into the Tour. Emma Isaac had been pedalling for an hour and a half when we got there – and didn’t get off until she’d clocked up 35km. Others came and gamely took their turn, tossing money into the big donations bucket. Colleagues popped in to give moral support – and to take the mickey! I managed a comfortable 7km before handing over to our new road safety manager Nick, a keen cyclist who breezed through his 6km while simultaneously giving an interview! Phil Thomas and Laura Maddocks. Day Five saw us at the closing event in Wellingborough, in the same office where Tour plans were first hatched. Despite having been all over the country supporting the event, Tour masterminds Phil and Laura were still full of beans. Staff here weren’t just cycling – though a steady stream flowed in to take turns on the two bikes. You could also guess the teddy’s name, take a punt on how many wine gums were in a jar and guess the weight of the beautiful Tour cake. And speaking of cake, there were loads of home-baked treats for cyclists to buy to put back the energy they’d burnt off on the bikes. We left Wellingborough saddle sore but buzzing – and already thinking about what we could do together next year. Thank you Securitas UK – you were amazing! * There’s still time to support this fantastic fundraiser – click here to donate. When you suffer a tragedy in your life surely you would want to help others? 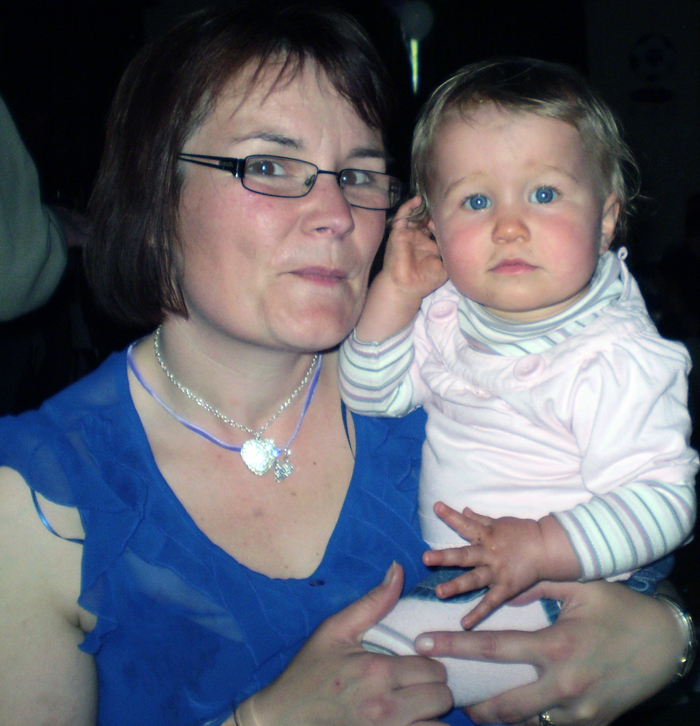 I’m Joy Edwards, and in October 2010 both mine and my family’s lives changed forever. On this morning my son, who was 8, walked into the twins’ bedroom and discovered his baby sister Leah entangled in a looped blind cord. I ran into the bedroom, raised my daughter to try and slacken the cord and untangled her. The ambulance was called and paramedics soon arrived and took over CPR on Leah. The ambulance and paramedics took our little girl and we followed after in a police car. When we arrived at the hospital I knew straight away the news was not good as there was a security man outside the room. Watching too many Casualty and Holby City programmes you learn the procedure. Leah was so cold and the colour had already started to drain from her tiny face. I willed her to wake up; she was never a very good sleeper and all I wanted her to do now was wake up so I could take her home to her siblings and twin brother. The hardest thing I have ever had to do is tell her brothers and sister that she wasn’t coming home. Our last photo of our daughter was in the September when she had her first ice cream. It’s a photograph we will treasure. After her death I decided that it would not be in vain and was determined to raise awareness about the dangers of looped blind cords. When ROSPA called and asked whether I would help with their campaign, I agreed without hesitation – well, wouldn’t you? ROSPA is a charity which relies on fundraising and charitable donations to raise awareness and prevent accidents. Without donations they would not have been able to give away thousands of free cleats and safety packs to raise awareness and educate families on the dangers of blind cords. They also campaign on risks around the home and the dangers of not wearing seat belts in vehicles, to name just a couple of things. Accidents occur on a daily basis and many can be avoided. Through raising awareness I hope the number of accidents can be reduced dramatically. When I start something I tend to carry on to the end. Even though new blind standards and regulations have been brought into force for manufacturers and fitters to adhere to, there is still more to do. Parents and grandparents who already have blinds in their homes still need to be educated on the dangers. I was honoured on June 17 to be given the Archangel Award and was amazed at the standing ovation I received. This is my first award and it has pride of place in our living room. Each time I look at it, opposite there is a photo of Leah smiling. I would like to think that she was proud too and that her death has prevented other families from going through the same heartache. 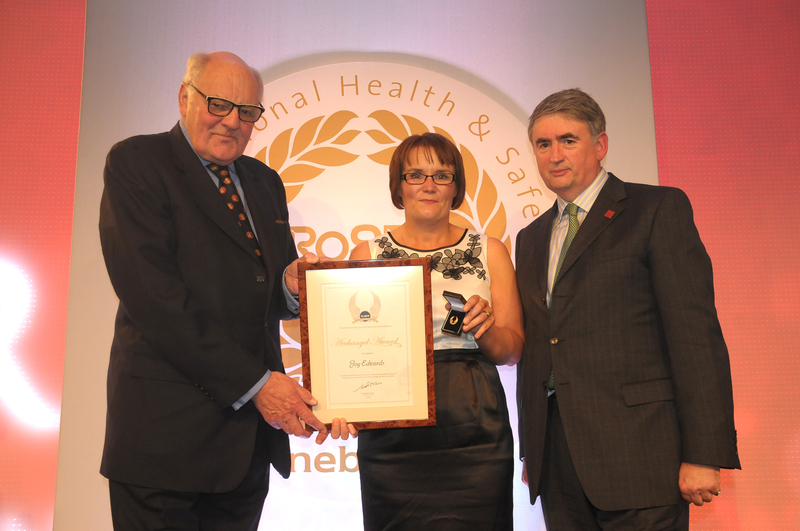 If you know of someone with an inspirational story like Joy, or someone who has worked tirelessly to improve the safety of those around them – whether they are a colleague, neighbour, friend or member of the community – we’d like to hear from you. Why not nominate them and show them just how much they are appreciated. Part two of Roger Bibbings’ story of the “East to West Slowly” challenge. Roger, our “easy rider” is pictured on the right. 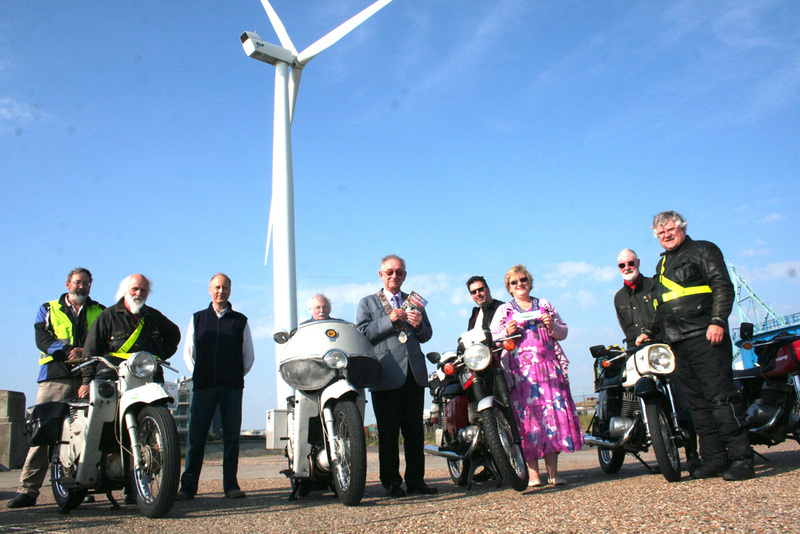 The party started out promptly at 8.30am from the foot of the giant wind turbine named Gulliver at Ness Point, in Lowestoft, on Saturday, June 21, seen off by the Mayor, Councillor Roger Belham, himself a former motorcyclist. The route ran past Bungay towards Diss and Thetford and out towards Huntingdon. A coffee stop at pub in the Cambridgeshire village of Wicken led to a conversation with the landlady who revealed that her son had been run over on the drive when he was three, although remarkably he had not been seriously hurt (driveway accidents are clearly more common than is realised). After skirting Northampton, the riders made their way by lanes to Banbury and then towards Stow-on-the-Wold, stopping briefly to see the solstice celebrations at the Rollright Stones. Following an overnight stop in and around Malvern the group headed off west the next day, stopping for a hearty breakfast at the Buttley Tea rooms at Winforton near Hay. After nearly two hours of fruitless fault finding the decision was reached that the three remaining bikes should press on to the finish, taking a scenic route over the Black Mountain to Carmarthen but thereafter sticking to the A40 to make up time. Approaching Haverfordwest they were met by about a dozen riders from the Pembrokeshire Vintage and Classic Motorcycle club, who had heard about the ride. They kindly escorted the three MZ machines on the final leg to meet the mayoral party at 5.30pm. Speeches were made and photos taken, including by the local press. Phil Speakman then rode straight back to Liverpool, while the other two riders and Phillip Thwaites enjoyed the culinary delights of St Davids. The next day was not without its dramas. Peter Henshaw’s MZ 250 expired on the way home with an obscure short circuit high up on the Black Mountain. With no mobile phone contact up there, the last remaining machine, the trusty little 150 MZ, with only 10 horsepower, had to be pressed into service to take a rider and pillion plus luggage (combined weight more than 30stone) to civilisation to summon recovery. All in all, though, it was a great adventure undertaken in glorious sunshine. The appeal for RoSPA’s Driveway Safety Campaign is ongoing. And plans are afoot for another “slow” motorcycle challenge in 2015. 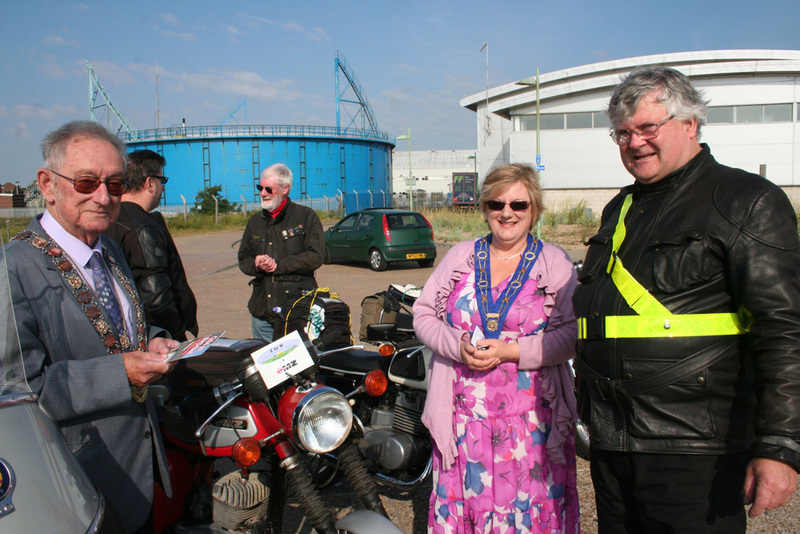 Roger Bibbings shares the story of an incredible fundraising road trip, ‘East to West Slowly’. 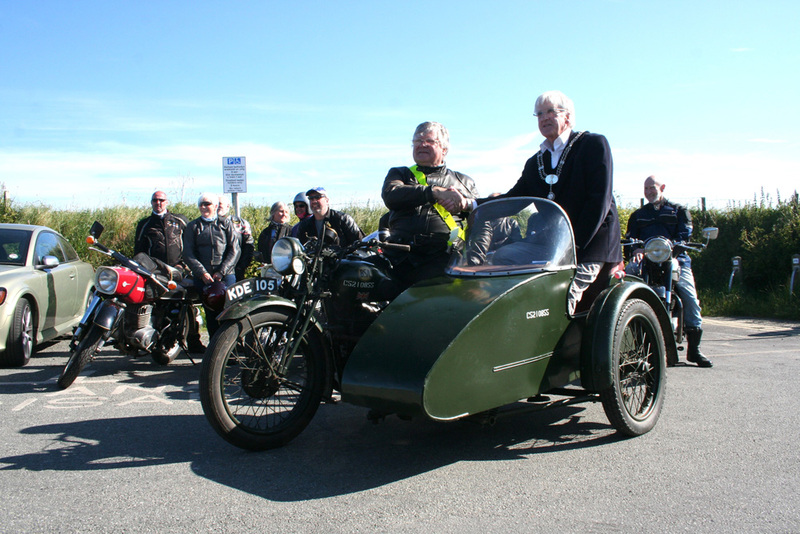 With minutes to spare, but still travelling at a steady 35–40mph, three motorcyclists on vintage two-stroke machines wound their way along the Pembrokeshire coast road to a rendezvous with the Mayor of St David’s. This was the culmination of a two-day ride across Britain from Lowestoft to St Justinian’s lifeboat station at the most westerly tip of Wales to raise money for RoSPA’s Driveway Safety campaign. At least 29 children have been killed on, or near, the driveways of their homes since 2001. Sadly, in most cases, an adult member of the child’s family, a neighbour or a visitor was driving the vehicle. The campaign raises awareness of simple measures that drivers can take to prevent such tragedies. Building on the similar ‘End to End Slowly’ trip last year from Land’s End to John O’Groats, the ride was held on June 21 (the longest day) and 22. It attracted six riders, although in the end only three, journalist Peter Henshaw, MZ spares guru Phil Speakman and myself, the organiser, made it to meet the mayor, Councillor David Halse, who came in a wartime BSA sidecar driven by fellow councillor Malcolm Gray. Councillor Halse kindly presented a cheque of £50 on behalf of St David’s City Council. Participants were on small vintage motorcycles. The party included two early 1970s East German MZ 250s, two MZ 150s and a late 1960s LE Velocette ridden by retired university lecturer and motoring writer, John Bradshaw. Ian McGregor, who was recovering from a recent heart operation, decided to follow in his camper van. The idea behind making the ride a ‘slow’ challenge was to savour the pleasure that is to be had from travelling slowly on two wheels using minor roads as much as possible. You see, smell and remember so much more. And the route offered a fascinating series of vistas, from the flatlands of the Fens to the high sandstone peaks of South Wales. You can find out about the ride itself next week. In the meantime, you can still donate to the campaign here. When you hear the word ‘motorcycle’, you tend to think of a lean machine zipping through the traffic. It’s a vehicle often associated with speed, yet I’m heading off on a slow motorcycle challenge this week to raise £500 for RoSPA’s Driveway Safety campaign. It’s the e2w slowly challenge and it takes place on the 21 and 22 June. 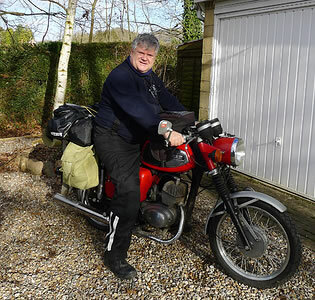 I’ll be riding my trusty 1979 TS150 MZ to raise money for RoSPA’s campaign, because at least 27 children have been killed on, or near, the driveways of their homes since 2001. Tragically, in most of these cases, an adult member of the child’s family, a neighbour or a visitor to the house was driving the vehicle. RoSPA has been working to raise awareness of driveway dangers among the parents, carers and grandparents of young children. And with your help, they can do more. My fellow riders and I will be set off from the most easterly part of Great Britain in Lowestoft on the longest day of the year and finish up in St David’s, the most westerly point, at sunset the next day. 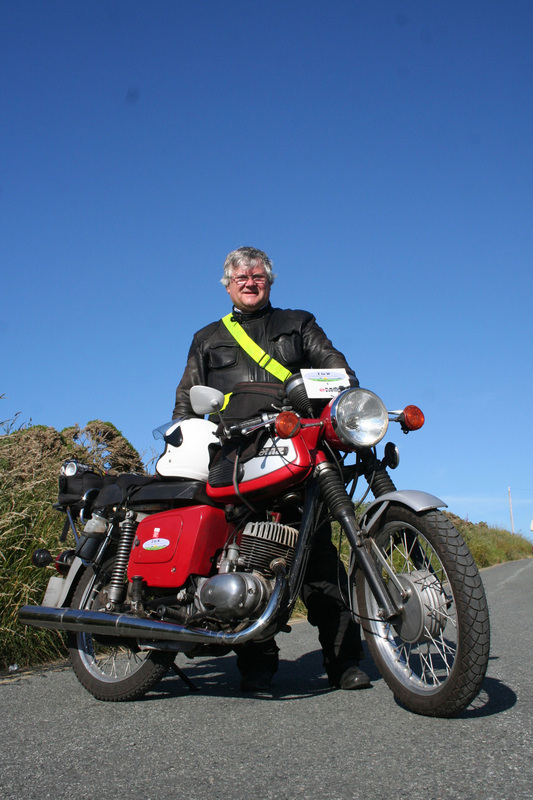 We will ride vintage motorcycles, mostly over 25 years old and under 200cc, and travel mainly on minor roads. We will carry all camping gear, tools and supplies (except water and petrol) on our bikes and¬ there will be no backup vehicle. Please help me to raise life-saving funds for RoSAPA. You can donate by visiting http://www.justgiving.com/e2wslowly. 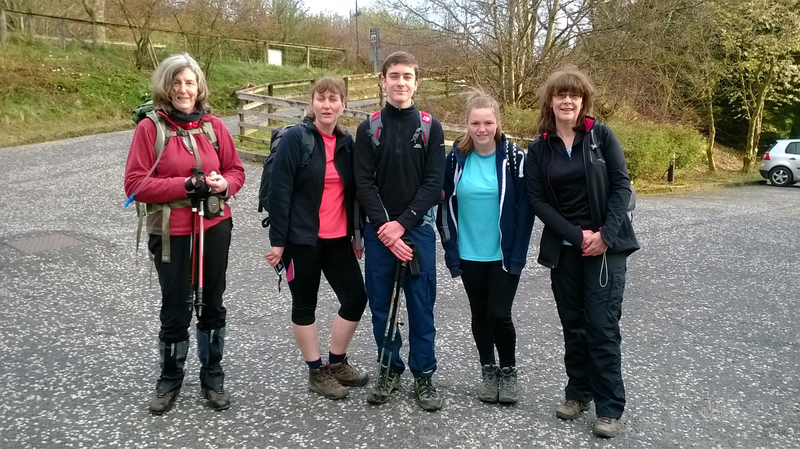 For the past few months, Liz Lumsden has been sharing preparations for her West Highland Way walk in aid of a RoSPA child safety project. Here, she blogs about the tough 50-mile two-day trek itself. Liz (far right), Donald (centre) and friends at the start of the walk. Not many people will walk 25 miles in one day – and then get up the next morning and walk another 25! For me, that was the biggest challenge. I have done walks before of a similar length, but always had a day to recover before going back to work. To repeat the experience on a second day was not easy. My son Donald and I had agreed to walk 50 miles of the West Highland Way to raise funds for the printing and distribution of The Birthday Party, a children’s book about safety. RoSPA wants every child starting school in Scotland this year to get a copy. We began at 7am on day one with a climb out of Crainlarich before the terrain flattened out for a while during the seven miles over to Tyndrum. 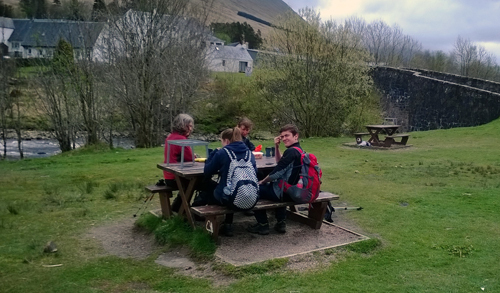 After a coffee we headed off over to Bridge of Orchy in time for lunch. We needed it – the next stage was a real climb and ended up on Rannoch Moor – 10 miles of desolation – before the long walk down the mountains to the only hotel for miles – the Kingshouse. We could see it from it about three miles away and kept thinking about the bath and the hot meal that were waiting for us. I ached from head to toe by the time I crawled (almost literally) into bed that night. I didn’t feel much better the next morning, but there was no going back. It wasn’t a very appealing thought to get started as the rain had been pouring down most of the night and had only eased off a bit by 8am. The group reach the all important half way point and stop for a spot of lunch! Well deserved we say! Waterproofs on, we were ready to complete the challenge. After a fairly flat start we had to climb the Devil’s Staircase. It’s tough, but thankfully doesn’t last for long and the following section is mostly flat or downhill into Kinlochleven. The sun even came out for a while. We were able to enjoy lunch in the sun before popping into a cafe in Kinlochleven for coffee and white chocolate “rocky road” (my favourite!). The sugar rush kept us going on the long climb out of Kinlochleven and down through the most amazing valley before the final slog to Fort William. Like the previous day, we could see where we wanted to be long before we reached it. The last section of the West Highland Way is on surfaces that are very unforgiving and our bones started to really ache with about five miles still to go. We walked with friends who were fundraising for other charities and had a real sense of achievement when we crossed the finishing line. We all had friends and family to meet us and were receiving text messages during the last few hours encouraging us to “keep going”. Donald and I love to walk, but this was certainly his biggest challenge to date and he completed it suffering from only one blister (I managed to avoid having any – thanks to the amazing properties of Vaseline!). I managed to exceed my fundraising target, but we still need money for the project. Every £1 raised will mean three parents can share home safety messages while reading The Birthday Party to their children. You can still donate at www.justgiving.com/elizabeth-lumsden2 or by texting WWHW50 £2, WWHW50 £5 or WWHW50 £10 to 70070. 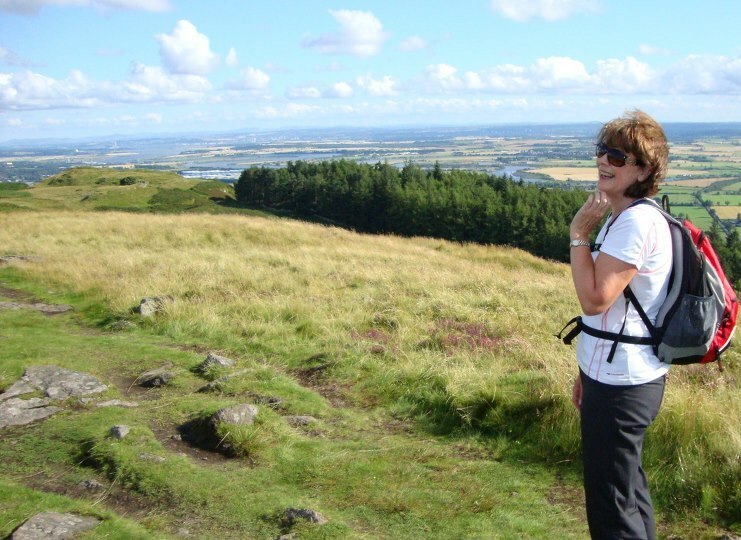 Liz Lumsden is midway through training to walk the West Highland Way for RoSPA. In her latest blog, she tells how an injury threatened to derail the venture. Liz takes in the fresh air during her walk. I’m just £1,000 away from being able to print and distribute 60,000 children’s books with a safety theme. I need the money by the end of May so they will be ready to give to children starting school in Scotland this summer. I’ve already sourced £15,000 for the project. My son, Kenneth, and I have been training every week to complete a 50-mile trek to raise funds for this child safety project. Just when I thought it was going so well, injury strikes. We’ve walked the first 27 miles of the Way together (as well as some local canal walks) and had some great mother and son bonding time. He’s not long moved back from London and it’s been great to spend so much time with him. However, Kenneth started to feel a twinge in his knee after having done a few miles of walking down steep inclines. It was brave of him to insist he was going to be fit for our big walk on 25th and 26th April, but unrealistic. During last week’s training along the canal out of Edinburgh, his knee became really sore. He had to get a lift home while I continued with the remaining 14 miles. So, the decision was made. He is really disappointed but there are only a few weeks left to get fit for the walk and we both knew it wasn’t going to happen for him. What to do next? The walk still has to go ahead – we need the money to publish the book. I didn’t relish the thought of completing this walk on my own. It will be over some very difficult – and remote – terrain. I was telling my younger son, Donald, about his big brother not being able to join me and he “stepped up” and offered to complete the walk. This will be great. Donald’s done the West Highland Way before, albeit not covering so many miles in such a short period, but I am confident he can do it. He is 16 and still growing so his comfortable walking boots are now too small. A new pair will have to be bought and broken in. By the time you read this, we will have done the middle stretch of the West Highland Way over the weekend, covering around 12 miles. During the following weeks we will take every opportunity to don our boots and get out so we are fit for this major challenge. Thanks to all who have donated to this great cause. If you haven’t yet, please consider putting even a few pounds into the fund. Donald and I really need your support. Please visit my fundraising page at www.justgiving.com/elizabeth-lumsden2. When we begin our walk for real, we plan to feed updates into RoSPA’s Facebook page so you can all follow our progress at www.facebook.com/rospa. Kenneth Hamilton tells us why he’s fundraising for RoSPA. I have always known about RoSPA for as long as I can remember: my mum Liz has worked at the Edinburgh office for nearly 20 years. When I heard that she was walking the West Highland Way to raise money for the charity I was really happy to help. Kenneth with his trusty Nordic walking poles! I have wanted to walk the West Highland Way for a while but have never committed to it before. This will be a good opportunity for me to carry out the walk and help raise money for a RoSPA and Go Safe Scotland project. My mother and brother covered the West Highland Way in seven days. We will be walking half of this journey in two days, so the pressure is on to get fit and fast! I work out regularly in the gym and I have just taken on a challenge to do 10,000 kettlebell swings in four weeks. This will give me a physical (and mental) challenge to work through and complete, and will help with my strength before the walk. So far my mum and I have practiced every second Sunday and will continue to do so until the day of the walk in April. 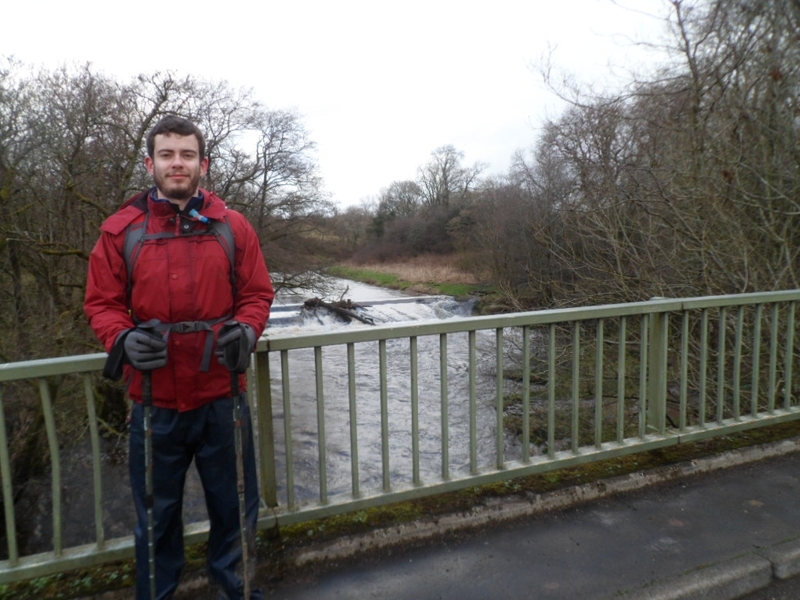 On the first practice run we walked from Linlithgow, along the canal, to Falkirk train station. My fitness was fine but I did get a pain in my knee and just made it to the train back home! The second training Sunday was a few miles longer. We walked the first part of the West Highland Way and we will continue to walk each subsequent part so that I will have actually completed the full journey. Kenneth makes a quick pit stop while in training for the West Highland Way. I tried out Nordic walking poles and was very surprised how much they helped with speed and release of pressure on the joints, I will definitely continue to use them and would recommend them to anyone. Although the first part wasn’t very difficult I know that it will get harder and the extra miles each day will be quite difficult. So I will continue to work out at the gym and we will both continue walking every second weekend. I’m raising money for a RoSPA/Go Safe Scotland project my mum is working on. It’s a book which will be available initially to all children starting school this summer in Scotland. The Birthday Party has been written by award-winning children’s author Linda Strachan. It is part of an initiative to provide safety education for primary school children. If you would like to sponsor me please visit, www.justgiving.com/Kenneth-Hamilton and “gieze awe your money”. The training plan has been drawn up and we’re off! 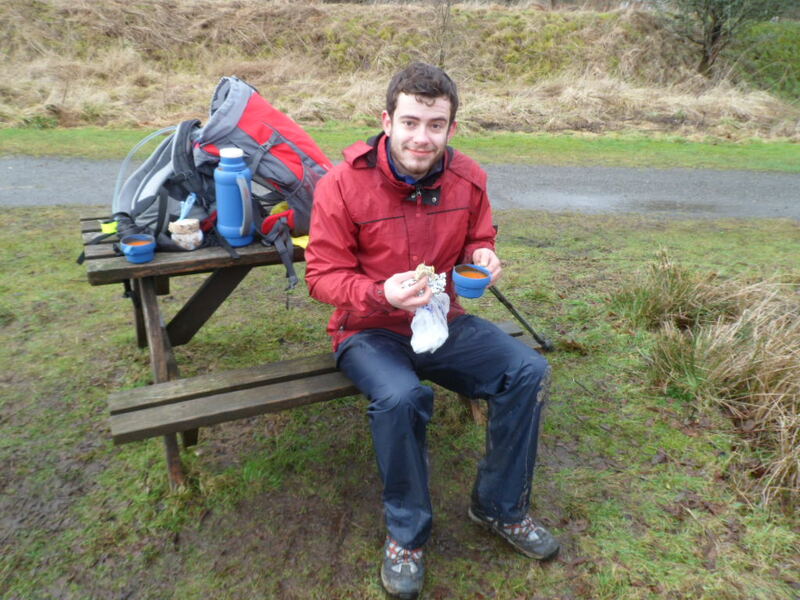 My oldest son, Kenneth, has decided he will accompany me on a 50-mile walk to raise funds for RoSPA. We will walk the second half of the West Highland Way in April. We’ll cover 25 miles each day, from Crianlarich to Fort William. The entire 96 miles of the West Highland Way winds through some spectacular scenery, but this final section involves some tough wee hills such as the appropriately-named “Devil’s Staircase”. I have walked the entire Way twice before in the most amazing weather. Some days have been really warm but others resulted in me having to pour the water out of my boots at the end of the day – and put them back on soaking wet the following day! I hope we will be lucky with the weather. At least we won’t have any midges to contend with – too early in the year. It’s going to be a real challenge, however, to cover this section in two days as I’ve only previously managed to complete it in three and a half. All money raised will go towards the printing and distribution of a fantastic new resource which will be available initially to all children starting school this summer in Scotland. The Birthday Party has been written by award-winning children’s author, Linda Strachan, and follows a group of children as they prepare (safely) for a birthday party at home. It will see the beginning of a family that will become familiar to children in Scotland when a further series of eBooks are developed as part of the Go Safe Scotland initiative to provide safety education for primary school children. 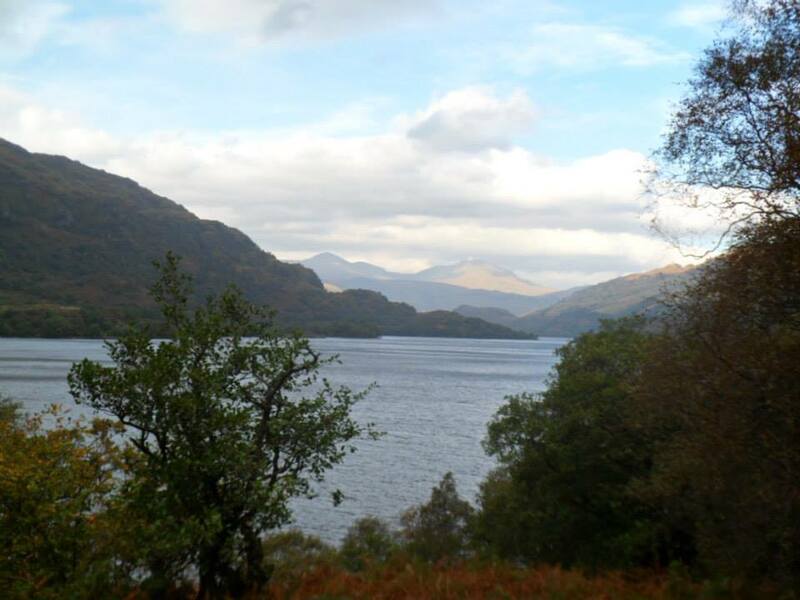 Loch Lomond – one of the many breathtaking views which Elizabeth and her son will encounter along the way. It is important to set the scene as early as possible, so children start to think about safety and become responsible for their own actions in a manner that does not stop them enjoying a wide range of everyday activities. So, back to the training plan: Kenneth and I have begun with a nine-mile walk along the canal and will work up to a full 25 miles from Linlithgow to Edinburgh leading up to the challenge on 25 April. 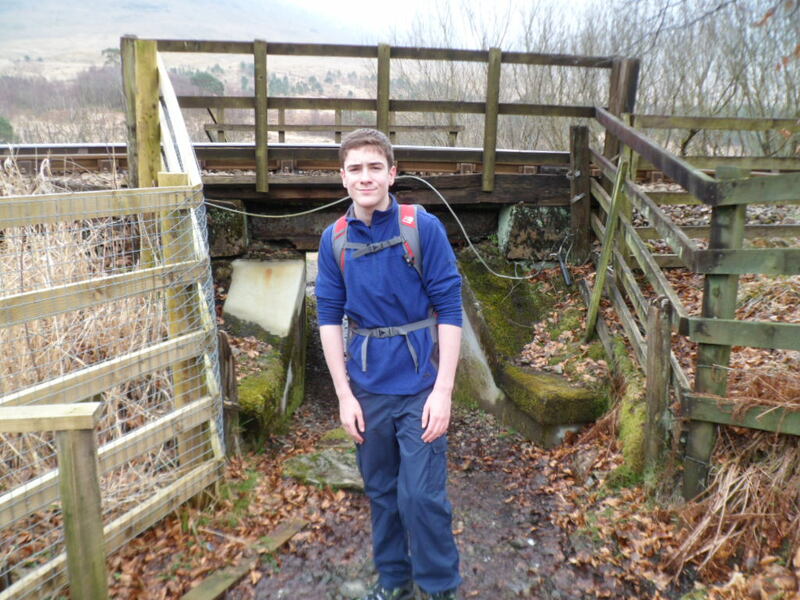 As Kenneth has never had the opportunity to complete the West Highland Way before, we are going walk the first sections of it as part of our training programme too. If you would like to donate, visit my JustGiving page or text WWHW50 £2, WWHW50 £5 or WWHW50 £10 to 70070. 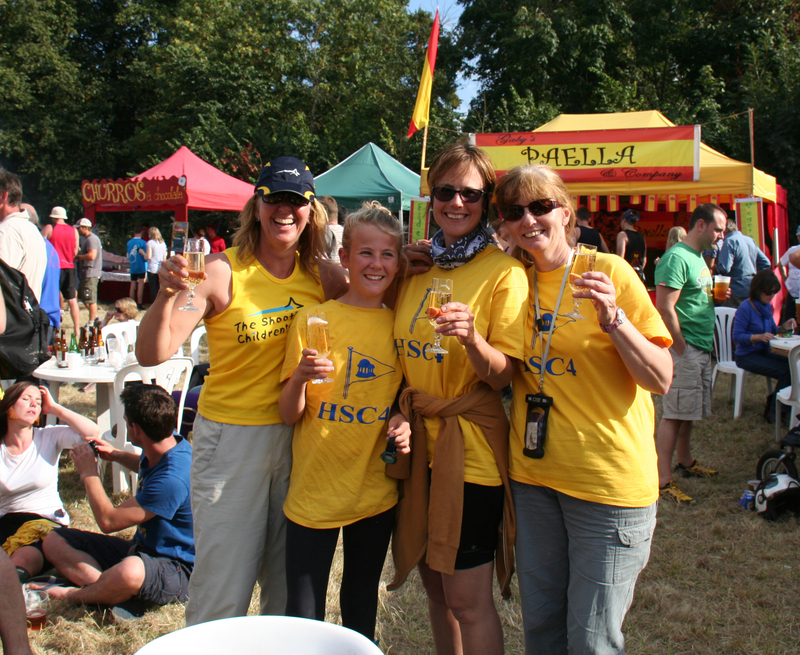 Amelia, pictured in the middle wearing a blue neck scarf, and friends celebrate after completing The Great River Race 2013! The Hampton Sailing Club decided to raise money for RoSPA in memory of our dear friends Alison and John’s son Richard Hollands, who died in March 2013, aged 32. “Our dear son Richard’s untimely death was caused by a fire in his West London flat, which started whilst he was sleeping. “In memory of Richard, we will be working with RoSPA on a campaign related to the dangers of fire for young people living in flats in London. Ellen, Jane, Annabel and I rowed The Great River Race, London’s 22-mile river marathon, on 7 September, 2013. We were in a classic wooden Thames skiff, beautiful, but older and heavier than today’s racing skiffs and with no sliding seats! 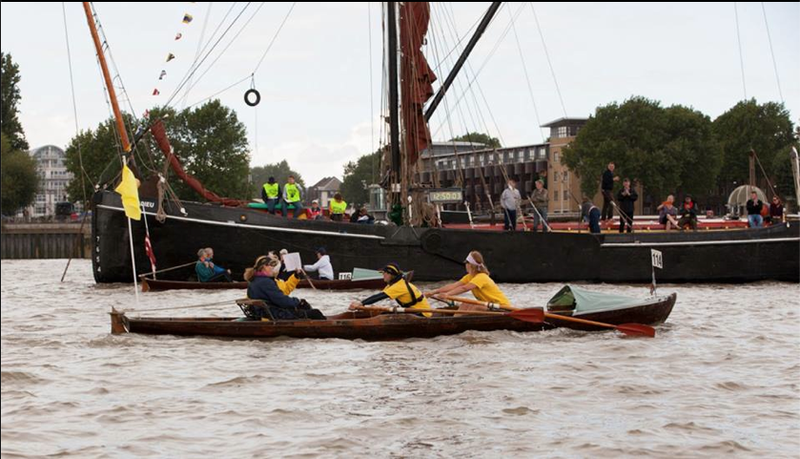 It was a spectacular boat race up the River Thames, with over 300 crews from all over the globe. There was every level of competitor, from those who enjoy fun, fancy dress and charity stunts, to serious Olympic-level teams. And they’re off! Amelia and friends put in some hard graft in memory of Richard. The race cannon started at 12.10pm in Greenwich and we hoped to beat our previous time of three hours and 40 minutes, luckily without the rain and thunder from the year before. Friends cheered us on and we had a lump in our throats as we passed The Rutland Arms, a favourite place of Richard’s at Chiswick Bridge, where we heard a cheer from a large group of Richard’s close friends, including Martin and Katy. Another emotional moment spurred us on when we arrived at Richmond Bridge soon after 4pm, where John, Alison and their grandson Rex cheered us along for the final stretch. We were so pleased to beat our previous time by 16 minutes and finished at Ham House in three hours and 24 minutes. I’d like to thank everyone so much for their support, we raised over £1,200 for RoSPA and we couldn’t have done it without everyone getting behind us to cheer us along. 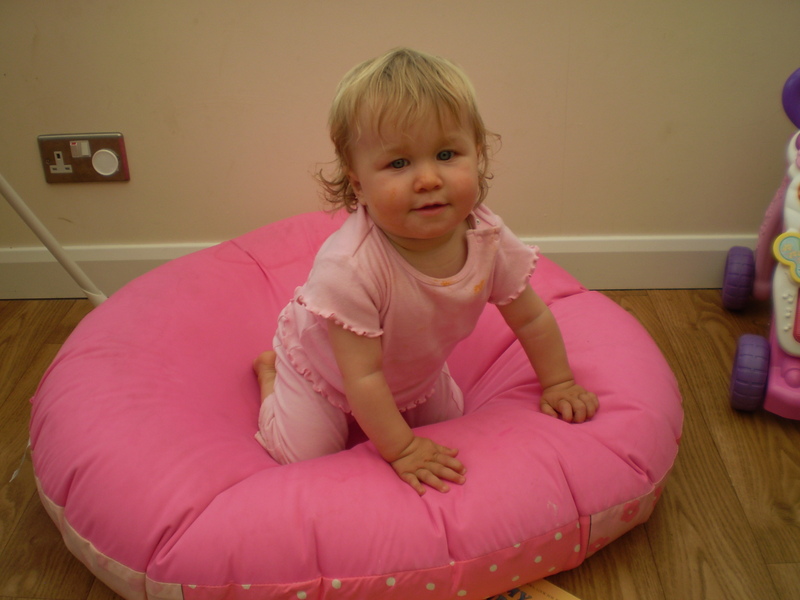 If you would like to support our life-saving campaign with RoSPA, visit our JustGiving page: www.justgiving.com/Amelia-Goodwin1.